My ears have a love-hate relationship with the phone. For 12 years, I’ve struggled to hear conversations from a variety of telephones—a regular landline, amplified phone, mobile phone, cell phone with Bluetooth capabilities. I tried phone captioning, but the captions didn’t always interpret word-for-word. Sometimes the words were scrambled or misinterpreted. That’s why I loved texting: No listening was required. But not all people text, and for those experiences with scheduling appointments, hearing on the phone was absolutely essential. I’d cringe every time I called the doctor’s office. This fall, ReSound, manufacturer of hearing assistive technology, partnerned with me on the Lipreading Mom Show Me Your Ears campaign. I was also honored to have been asked by ReSound headquarters to sample their newest hearing aid product: the Versos. Because of my positive experience with ReSound, I was more than excited to learn how ReSound could help those of us with hearing loss hear better on the phone. When I heard about the company’s new phone listening device, the Phone Clip+, I went to ReSound’s Commercial Product Manager, Jennifer Carlsen, with questions. How is ReSound’s wireless phone accessory different than anything else on the market? JC: The Phone Clip+ is a first in this industry. It’s “Made for iPhone” designation means that it is has been designed to connect specifically to iPhone and has been certified by the developer to meet Apple performance standards. ReSound is proud of this certification. The Phone Clip+ offers someone who is hearing impaired an additional solution to help them connect to their world, just like a non-hearing impaired person does – via mobile phone or Bluetooth landline phone, or to their iPad or iPod Touch to stream music. It offers additional benefits. When someone isn’t talking on their phone, they can utilize the Phone Clip+ as a remote control, to change programs or volume settings on their hearing aids, without requiring an additional accessory to carry with them. Who would be ideal candidates for the accessory? JC: The Phone Clip+ is easy to use, so it’s not limited to the stereotypical tech-savvy patient. The ideal candidate is any hearing impaired person who is looking for a little extra help on either their mobile phone or a Bluetooth landline phone, or streaming music from their mobile device, such as an iPad or iPod. Individuals using the Phone Clip+ also have access to a new app – ReSound Control. This enables someone to discreetly adjust their hearing aids via their smart phone, rather than a more obtrusive remote control. The app is currently available (at no charge) for iPhones in the iTunes Store and will be available in the Google Play store for Android phones at the end of the month. How long has ReSound worked to develop this product? JC: ReSound has been developing our 2.4GHz platform for several years. It was initially introduced with ReSound Alera and the first generation of Unite wireless accessories in 2010, and our team continues to develop to bring solutions to market like the new ReSound Verso, the Phone Clip+ and the ReSound Control app – and additional exciting releases that you’ll hear about in the future. How affordable is this accessory compared to similar products on the market? JC: The Phone Clip+ is extremely competitive with other wireless accessories on the market. Its ability to double as a remote control offers even greater value for the patient who would like the benefits of a remote control, but only wants to purchase one wireless accessory. Are there any other ReSound products planned for a 2013 launch that you would care to mention? 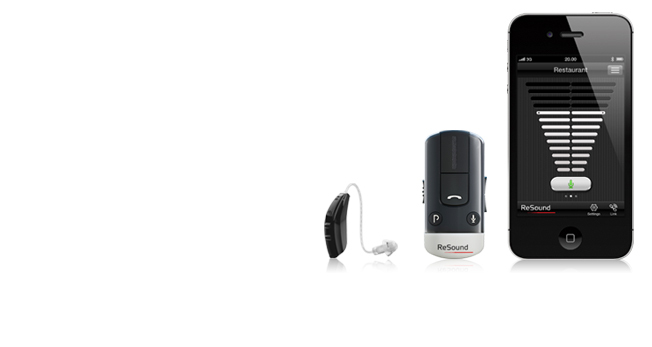 JC: ReSound will continue to expand our portfolio with the addition of Verso 5, a 3rd price point that will make Verso accessible to even more hearing impaired individuals. Verso TS will be a new solution to help patients who suffer from tinnitus. And ReSound will introduce the 2nd generation of Unite TV (streamer) and Unite Remote Control with many advances that have been requested by our customers and the people who are using the first generation of Unite wireless accessories. Lipreading Mom is delighted to have ReSound as a partner in the Show Me Your Ears Campaign to promote hearing loss awareness. Would you care to comment on my campaign as a hearing aid manufacturer? JC: ReSound supports initiatives that help create awareness for the impact of hearing loss and celebrate the moments patients can recapture through hearing instrument technology and the care of a hearing health care professional. Maybe Lipreading Mom can convince ReSound to let her try out the Phone Clip+ in the near future. When and if I do, you, my faithful readers, will be the first to hear about it. A note to LipreadingMom.com readers – Always do your research before purchasing a hearing assistive product. Just because one blog mentions one product doesn’t mean that there aren’t others out there that could perform just as well or better for your hearing needs. Keep us all posted. It would be a wonderful thing to use the phone again…..
Sandy – I certainly will! I think it’s great that you found a good solution, but also feel it’s important to not give too much credit to one manufacturer. This technology (bluetooth re-broadcasting) is available from many companies, as well as in the form of universal solutions that couple to telecoils. While “made for iPhone” sounds great, I haven’t seen any data to suggest that people using this bluetooth rebroadcaster will perform better than those using similar devices from Oticon, Phonak, Widex, etc. This is not to suggest that the ReSound product isn’t good, but rather to remind that there are functionally equivilent products for other hearing aids, including those that work with any hearing aid or cochlear implant that has a telecoil. Brad – It is wonderful to have you join the discussion and share your insight as an audiologist. Your point has been shared with Josh Gronninger, representative with ReSound. Should I receive a follow-up comment from him, I will let you know. Reblogged this on Accurate Hearing Centers. Shanna, could you explain more about how the Resound Phone Clip+ actually works to deliver sound to hard of hearing people, and what is required for compatibility with it? Also, it seems to me the title of the blog is not quite apropos since it only discusses one option for hearing better on the phone. There are many, many different ways to hear better on “the phone,” and one will need to factor in whether one is listening to a landline phone or a wireless phone. For example, a development that could be very useful for hard of hearing people is the growing availability of HD Voice, which provides a much fuller spectrum of sound when both parties on the call use compatible equipment on the service that provides this feature. Many hard of hearing people very much need to be able to hear the low frequency sounds below and above the typical bandwidth communicated by landline telephones (300 Hz to 3400 Hz), and HD Voice could make a considerable difference in helping them to hear as much as possible of what people are saying. (My understanding is that Apple’s mobile phones do not yet support HD Voice, although it could in the future.) Thus, I think part of the solution for hearing better on the phone is to pick a service provider and compatible phone equipment that will provide fuller sound and accessible and/or customizable audio. A hearing aid can’t provide the best audio possible if the service provider doesn’t provide full spectrum sound. The Phone Clip+ utilizes 2.4GHz wireless technology to deliver sound to the hearing impaired wearer. The primary function of the Phone Clip+ is to wirelessly route the sound from the telephone directly to both hearing aids of the user, similar to the way a Bluetooth headset delivers the sound from the phone directly to the user’s ear. It is established that being able to hear the phone signal clearly in two ears makes it easier to understand speech on the phone relative to hearing the sound in only one ear. The user pairs their mobile or Bluetooth-enabled landline to the Phone Clip+ and pairs the Phone Clip+ to their ReSound wireless hearing instruments. The Phone Clip+ has a microphone that picks up the voice of the user wearing the Phone Clip+ and transmits to the person on the other end of the line, providing hands-free access to the telephone. Conversely, the voice on the other end of the line is streamed via 2.4GHz to the hearing instruments on the individual wearing the Phone Clip+. I’m a little skeptical because this sounds a little too much like an advertisement. I realize you received the product free of charge but I’m wondering if this isn’t a conflict of interest? I enjoy your posts but this one and the ones regarding Resound strikes me as marketing. Unless other brands are evaluated I continue to question the promotion of one product over others. Of course unless other products fail to deliver like this one. @Salander – It is always good to read your comments. As for your concerns, this blog post is strictly a Q & A with ReSound about the PhoneClip+. I hope to test out the product soon and will provide an objective perspective about my experience. Be watching for it on my blog in the near future. By all means, if you or any of my readers have other perspectives about hearing assistive technology, I would like to read them. Thank you for following my blog! I am a young adult, young professional who uses the Resound Alera hearing aids and the phone clip. I was originally a Phonak person. I have gone through at least 3 different “generations” of hearing aids. Please keep in mind: This is just the start of the Bluetooth technology with the hearing aid companies. Right now in the Bluetooth world, if you have hearing aids you have three choices: speakerphone, a phone clip (Resound) or a phone clip necklace (Phonak). As the end user, I am ever jealous of the sleek items that normal people have available. hearing aid technologies have been clunky and at least 5 years behind in terms of “trending”. And to be honest – there is nothing out there for the teen or the young professional. If I am heard of hearing, my sight must be going as well, right? I cannot wait for someone to come up to my door and ask me to be a beta tester on some of the new technology coming out with the hearing aids. Alas, I digress. How it works: you have a phone, your hearing aids and this clip. You “pair” or connect your hearing aids and your phone to this clip. Once paired, if the phone rings or sends off a notification – your hearing aids will activate the phone mode that is programed in your hearing aids. The clip needs to remain within 6 inches of your mouth to actually catch your voice. It is pretty smooth transition and the activation noises will definitely catch your attention. I haven’t had too many issues with communicating with other people. But I am going through batteries like water! Every two days I am switching my batteries out for a fresh pair. Also, the attachment piece on the clip is made of low-grade plastic, Once the clip part breaks, it becomes very clunky to use. After 1 year of use, I had to get a new phone clip. So be careful on how you use the clip! Resound hearing aids seem solid – but I do miss having Phonak hearing aids. Phonak is one of the top companies so everyone knows how to use those hearing aids. Resound is a lesser known brand so your audiologist is learning along with you when you get a pair. Rose – Thank you for sharing what the PhoneClip+ was like for you. I can understand about the battery drain, as these hearing accessories can take out a lot of power from them. Be watching this blog soon for my experiences with the clip. Hi Rose- You offer great insight from the perspective of a young person with hearing loss. As a family-owned, small, boutique manufacturer of solutions for people with hearing loss, we are always looking for people willing to test new product ideas and product feedback. This is exactly how we have created new products- through inspiration from our own family members with hearing loss and from the invaluable feedback of the remarkable people we meet. We would love to talk to you about this. You can reach out to michele.ahlman@clearsounds.com. « Do You Have Hearing Loss…or Selective Hearing?